Ceramic materials have found numerous applications in science, technology and industry as mentioned earlier. 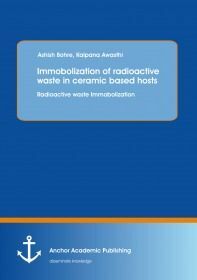 One of the recent applications of titania and zirconia based ceramic precursors is in immobilization and solidification of radioactive isotopes in waste effluents coming out of nuclear establishments and power plants. Due to long term stability and integrity of the ceramic waste forms of high and intermediate level nuclear waste, several countries have now switched over from ‘glass technology’ to ‘ceramic technology’ of radwaste management. These and many more applications make ceramics materials an interesting area of research and engineering sciences. The book is particularly aimed at scientific and technical staff in the nuclear and waste management industries in addition to universities and research organizations active in these areas. It will also appeal to a wider audience with interests in environmental issues and will be of benefit to anyone who requires background information on radioactive issues connected with nuclear energy or defense processes, or hazardous waste sources, properties and treatments using crystallographic methods.